Did you know that tobacco use kills more than 7 million people every year and costs American households and governments over $1.4 trillion through health care expenditure and lost productivity? Tobacco waste contains over 7,000 toxic chemicals, which negatively affect not just tobacco users, but also the health of non-users and the environment. Tobacco farming especially affects children and women. For example, 60-70 percent of tobacco farm workers are women, who are exposed to the toxic chemicals on a daily basis. 10-14 percent of children of tobacco-growing families not only grow up among hazardous chemicals, they also miss school due to their work in tobacco fields. Tobacco control is an important tool to improve community health and to achieve the Sustainable Development Goals (SDGs). One of the goals of the SDGs is to reduce premature deaths from non-communicable diseases (i.e. chronic diseases) by one third by 2030, including cardiovascular and chronic respiratory diseases, cancers, and diabetes (WHO, 2017). Here at WellShare, we work on Tobacco-Free programs with East African Communities and with the Karen community (in partnership with the Karen Organization of Minnesota). The estimated smoking prevalence among Somalis in Minnesota is much higher than estimates for other Minnesota adults. Much like other communities, Somalis face many barriers while attempting to quit smoking and, due to cultural and language barriers, they need extra attention when it comes to clinician guidance and smoking cessation. The Karen and other refugees from Burma (Myanmar) also have higher usage rates of tobacco products and betel nut, a stimulant often used with tobacco. The use of these products, as well as a high exposure to second-hand smoke, causes many health problems for children, young adults and the elderly. For our Tobacco-Free programs, WellShare works with the entire community. We consult with religious leaders and use Karen and Somali Community Health Workers that provide culturally and linguistically appropriate services via community outreach and educational workshops. You can learn more about our tobacco-free programs here. 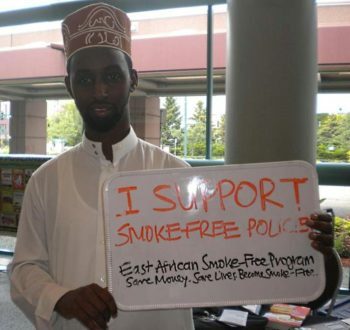 WellShare’s East African Smoke-Free Program is funded by the Minnesota Department of Health’s Tobacco Free Communities Grant.